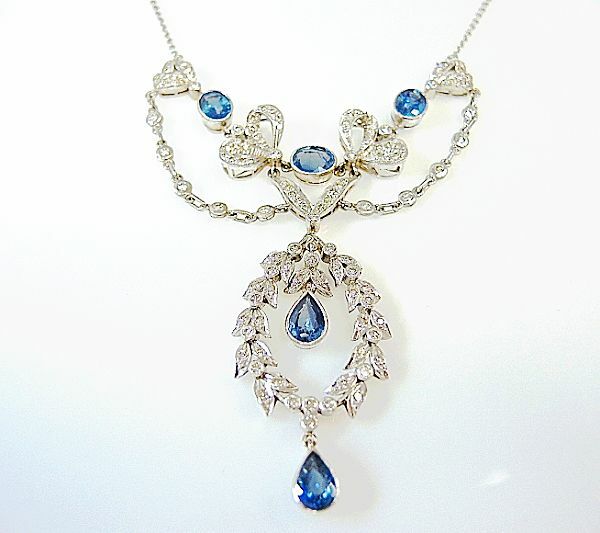 A beautiful Edwardian style 18kt white gold necklace featuring 2 pear faceted cut medium blue sapphires, est. 2.88ct; 3 oval faceted cut medium blue sapphires, est 4.35ct and 116 round brilliant cut diamonds, est. 2.77ct (VS clarity & I-J colour). It is approx. 16.75 (16 3/4) inches or 42.55cm in length.